Doing a dressage horse painting commission portrait of dressage rider Courtney on her lovely black dressage mare Beauty was a pleasure. Not only was it wonderful to get to know them – I feel like I was able to capture a special time in Courtney’s life. I met Courtney last year when she won the dressage painting commission portrait prize I had donated to the Rising Stars Youth Dressage Show in Abbotsford, BC. Courtney was doing 2nd level very very successfully. I painted their dressage horse painting portrait from photos of that season. When I presented their dressage horse painting commission portrait to Courtney this spring – Courtney was now well into showing at third level and had somehow gone from being a young girl at a youth show – to a young women showing competitively in a division made up of mostly dressage professionals. I think Courtney’s mom also got this – there were some happy tears. 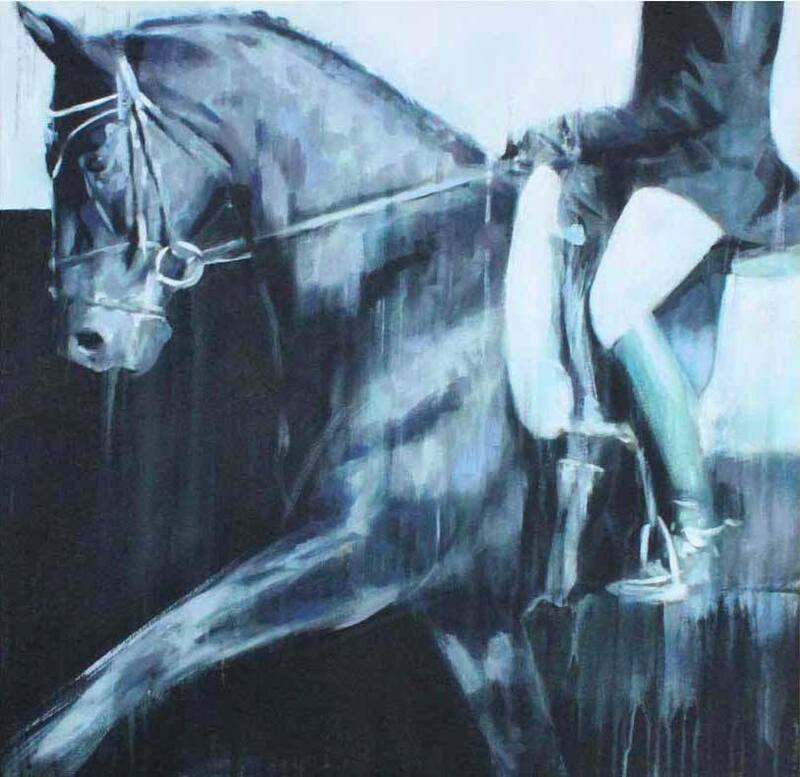 Somehow this dressage horse painting captures Courtney riding as a young girl and clearly that moment has passed. I am pretty sure we will be seeing a lot of Courtney at the advanced dressage levels in the very near future. I don’t copy photos exactly – Kind of like riding a dressage test – I show off whats best and down play any weak points. I add a little drama by making horses a little more uphill and maybe even increasing their range of motion. Then I simplify the details to create a focus for the painting. In this case – if you watch these two – their strength is consistent balance. I used the horizontal colour break in the background to emphasize their ability to perform the movements without any changes to their balance. I chose a limited palette of colours that will bring a bright, positive presence to this young womens room. October 3, 2003 two little fillies, 4 months old, were shipped from Saskatchewan on a cattle truck to BC. They were PMU foals purchased from a slaughter house for human consumption. Rescued from certain death they were introduced to Courtney on October 23 at a transition farm. They were heading to a home of an elderly couple who took pity on them. Huge eyes so full of fright, malnourished, skin rashes and numerous ailments, these two spindly babies were terrified to approach anything human. Courtney at three years old posed no immediate danger and would sit in the center of the stall with a flake of hay. Soon the babies were eating from her and she was able to start to touch them. The start of a wonderful journey. Moving onto a new home Beauty and her sister flourished. Life was good, square meals, loving attention, summer days rolling down the sawdust pile looking for mischief. Winter brought balls of fur, snow trenches with their muzzles, warming cold hands on their hot breaths. But they grew very fast. Beauty had spirit and excitement and they needed a larger home. They went off to the island where Beauty was immediately removed from her sister; she went crazy and had a huge emotional breakdown which would take years for her to recover from. Almost instantly Beauty became very difficult and dangerous. An accident in her stall bars sent her to her new owner’s private home where she broke out and had an accident with a vehicle. Leaving her with a severe road rash and even more untrusting. She was renamed Nightmare and later on Shady Lady. Having no other choices she was placed back up for sale, the original owner Betty repurchased her and gave her to Courtney and her mother. She came home with a nasty mean strike, resulting in many bumps and bruises, lots of tears and even a broken arm for Courtney. Through perseverance and patience Courtney has managed to win back Beauty’s love. Four years or so ago Courtney and Beauty came to love dressage. The mare’s natural abilities and will to try has started a wonderful road of success. For 2014 Courtney and Beauty have won several schooling shows and as well Championship titles for Touch of Class, Regionals, and Reserve at Heritage Finals, overall gold at Rising Stars and not to mention four gold medals at the BC summer games. Beauty sent Courtney off to Quebec for the inter provincials where Courtney brought home 2 silver medals for BC and received the 2014 Junior Athlete of the Year award.. Several Championships for 2015 at second level, Courtney and Beauty are climbing the ranks. Another Rising Star victory ended these 2015 season in style. They are working on third level/FEI this year with Rochelle Kilberg as coach to continue their rise to success. Trying hard to qualify for the North American’s on their road to achievement. Becoming the Overall Gold Champion at Rising Stars last two years was such a wonderful experience. The competition is packed with high level riders and horses. I never thought that I would be the overall winner and was surprised and overcome with emotion. Such a fantastic show run by dedicated staff and volunteers. A big thank you to everyone especially my talented coach Rochelle Kilberg and my awesome partner Beauty.